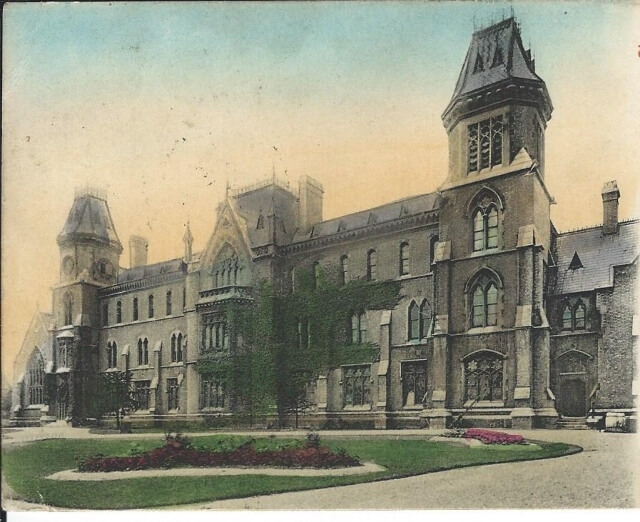 Wood Green Crown Court : What was there before ? Medieval Wood Green, first mentioned in 1256 as part of the extensive manor of Tottenham, was regulated through several manorial courts which appointed constables to keep the peace. Early in Henry VIII’s reign the hamlet has its own constable (1515) and features in the rolls of the Tottenham Manor Court. Records reveal evidence of illegal tree felling, the enclosure of common land and the failure of landowners to scour ditches and maintain bridges over streams. 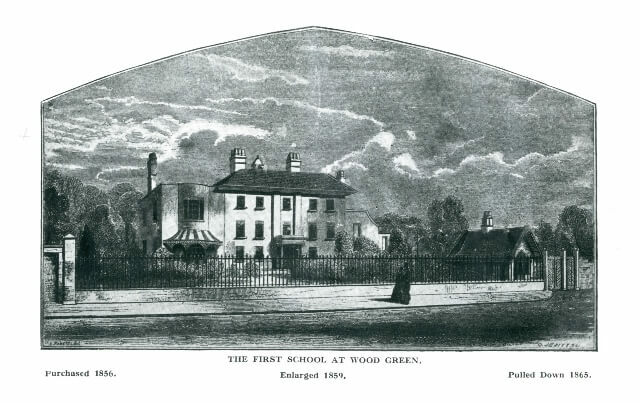 So over the centuries Wood Green has been no stranger to criminal proceedings. The small hamlet began to expand in the late 18th century when successful City entrepreneurs started building country houses for themselves away from the increasingly polluted metropolis. One such private residence in its own ten acre grounds in the mid-19th century was Lordship Lodge on Lordship Lane of which an image survives. The Lodge was recorded in 1844 as a private house and grounds. In 1856 Lordship Lodge was acquired by the Royal Masonic Institution for its school for 70 boys opened in 1857. Boys were the sons of deceased and needy Freemasons. This school was demolished and replaced by a substantial Victorian Gothic building designed by Edwin Pearce and J B Wilson & Son in 1865. The new building accommodated 200 boys. The school provided a thoroughly commercial education to equip these young men to follow in their fathers’ footsteps. It moved to Bushey, Hertfordshire, in 1898, after Princess Alexandra had attended the final prize-giving in Wood Green. 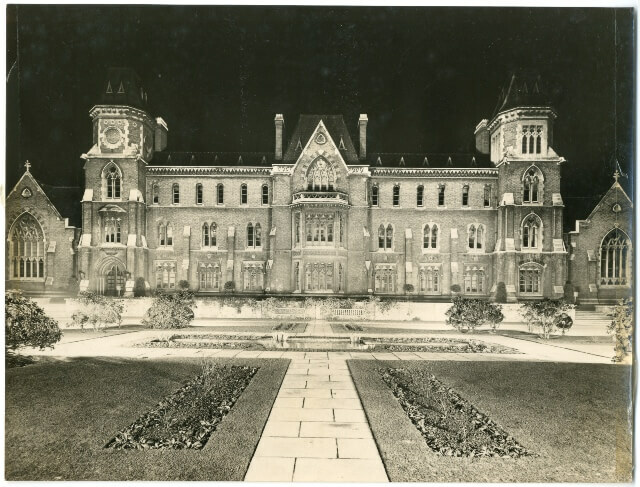 From 1904 until 1930 the building housed the Home and Colonial School Society’s Training College for Schoolmistresses. This was a Church of England institution founded in 1836, ‘for the Improvement and Extension of the Infant School System at Home and Abroad, and for the Education of Teachers’ (The Times 1837). One of the founders, Elizabeth Mayo, was the first woman in England to be employed in teacher training at the Society’s college in Grays Inn Road. The Infant education promoted was very forward looking and was against rote-learning, the favoured method at that time. In 1930 the building was acquired by the Tottenham and District Gas Board and renamed Woodall House after its chairman, Sir Colbert Woodall. It later became the headquarters of Eastern Gas. In 1974 Haringey Council purchased the site and Woodall House was renovated and remodelled to become Wood Green Crown Court which opened in 1989. Part of the original site was developed for housing.